I have the best job in the world when I get to read the blogs of my students on how their 20 Time projects are going. I never know what I'm going to get when I open a student blog. It might be something on their project, it might be something about how they are feeling at the moment and other times, it's just a little update on their lives. I wanted to share a few blog posts from the past few weeks that have really stood out to me and show why every school should have some form of 20 Time. "I am just so fortunate that I have been able to meet with so many new faces and I just can't believe it! I probably have met more people than I have my middle school years and freshman year combined. But the one thing that is so amazing is how everyone comes up to me and says, "thank you so much for filming me, or him/her, or us".To me I had been seeing filming them as kind of something that might get in the way of their work, or take up valuable time, but instead I hope I have been able to spotlight them in a comfortable way. It feels good to have put a smile on their face and helped them share their story, and I'm just lucky for this experience." I love this attitude that Alexis has for this project. She feels lucky to have had the experience of meeting new people and hearing their stories. In a world that seems, at times, to be focused on "me me me", it is so great to see someone appreciate other people and the lives they are leading. She has dedicated her time to exploring the lives of other people and hopes to learn something about herself in the process. That is a huge win for the idea behind 20 Time in the classroom. "Every winter my family and I go up north to Traverse City and the same with this year for a week. The first day after making the trip up north, my family and I went out on the Grand Traverse Bay which for once in a long time was frozen over. My dad and brother started shoveling a certain area that they believed was smooth so they could skate. But when I went down and grabbed a shovel, instead of joining my dad and brother,I took my shovel and just went. I shoveled my own path. I went on my own way. By shoveling snow in this way I was able to find a perfect patch of ice out on the lake. My dad eventually came over to me with a confused look and demanded that I shovel in the main area instead of "goofing off" and randomly shoveling around. Yeah I looked silly and maybe a little strange, but if I hadn't have done that, i would never had found that perfect patch. Instead of conforming,I tried something new,and it worked. But it's not always going to work. It's not always going to happen exactly theway you want. What if I had not found that perfect patch? Would I have failed? No. I would look funny randomly shoveling the ice out on the bay, but I would not have failed. I would still be adventurous and keep trying new things. carpe diem. Try something new. Stop doing the things you do everyday like a pattern. Seize the day and do something new." Gennie has been working hard on her project and has encountered many roadblocks along the way. I love this idea from her because it shows the power of what 20 Time can do for students. By allowing Gennie to explore her ideas and pursue her passion, she has had a chance to think about her actions and how it is sometimes ok to be different and explore the world in a different way. These are the ideas educators should want to foster in students and I'm excited to be part of her journey. "Since a young age, I have always been interested in biology and medicine. After taking Honors Biology freshman year, I began to understand in detail how my body functions every day. When ever I get sick, I now know what my body is doing to fight off the illness. I find it very fascinating! About six years ago, my dad was diagnosed with Ménière's disease. According to the National Institute on Deafness and Other Communication Disorders, "It is a disorder of the inner ear that causes severe dizziness (vertigo), ringing in the ears (tinnitus), hearing loss, and a feeling of fullness or congestion in the ear." After having multiple surgeries and taking many medications, my dad still can not hear out of his one ear. Doctors still do not know why people get this disease or what causes the disease to happen. It also does not have a cure yet. Through my 20 time project and biology class, I have developed a passion to solving the unanswered questions about this disease. I know this will be extremely challenging, but I am up for it!" Leonie has taken an interesting path with her project. She started out looking to design a better cover for cameras to take pictures in the rain. After the first part of the school year, she came up with a version that was pretty effective, but she realized that it wasn't something she was as passionate about as she thought. She has now changed her project to something very challenging. I think about 20 Time and I see students taking on personal challenges to accomplish tasks or learning something new and I think about the great experiences they are going to have. I look at Leonie and see someone who could make a difference in the world. Her project could lead to something amazing. Sometimes, all it takes is a different set of eyes looking at a problem to come up with an amazing breakthrough. Giving her the time to explore what really matters to her has inspired her and no bubble test could ever duplicate that. These are just three of many of the amazing things that are going on in my classroom. I have 90 students participating in my 20 Time experiment. Imagine if my entire high school (1,700) were working on projects that mattered to them. What would 1,700 students come up with if they were allowed to explore their passions? The possibility alone should push you to looking into starting 20 Time in your school. Feel free to leave me a comment or send me a message if you have more questions about 20 Time in the classroom. Hello everyone! Welcome to Season 2 Episode 2 of #NerdyCast. In this episode, we will be talking about Homework, Girl Meets World and other fun and exciting things. You can listen to the podcast on my PodOmatic site or on iTunes. It would be double awesome if you would leave a comment/rating on iTunes to let me know what you think and continue the conversation. I encourage others to respond to our thoughts in the form of blog posts, podcasts, carrier pigeon, etc. Thanks for listening and I can't wait to hear what you think about homework. I asked Eric for a copy of his book so I could review it for my site. 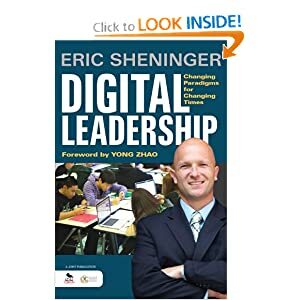 I'm really excited to share some thoughts on Eric Sheninger's book Digital Leadership: Changing Paradigms for Changing Times. I'm actually not one to read many books on education. I always feel like someone claims to have the next new answer to solve education and everyone gets very excited. A few months later, a new book comes out that tells everyone they have solved education's woes and everybody should read it. Well, this is not the case with Eric's book. First, After I looked up the word Paradigm, I dove into the book and found it to be a very quick and pleasant read. Also, look at that cover. In 12 Chapters, Eric covers some very important topics, but I want to talk about two that really stood out to me. Chapter 7: Branding is an excellent chapter and something every school administrator and educator should read. There are two views of what Eric calls "Brand-ed Thinking". The first is about a person's professional brand. It is important for educators to take charge of who they are in the digital world. If a person fails to claim their digital identity, someone else could do that for them. Using social media, Twitter, Facebook, LinkedIn, etc., to let the world know who you are and what you do is a good thing. I was always hesitant about branding myself and what I do. "The Nerdy Teacher" was not created to be a brand and I never thought of myself as selling me or my brand, but that changed over time as I started to be asked to write for different groups and speak at conferences. All of a sudden, I was more than just Nicholas Provenzano, I was "The Nerdy Teacher" and people wanted what that brand could bring to the table for them in different ways. What I've been able to do is use my brand to engage with other schools, districts and companies to provide opportunities for my students. That is the big part of branding that I see that can be valuable to all educators. By creating my brand, I'm able to offer more to my students and that is why I got started doing all of this in the first place. The second part of the "Brand-ed Thinking" is the school's brand. Eric points out that private schools have "flourished under institutional branding" (Sheninger 112). Having attended private school growing up, I know that Eric is very correct. Private schools are all about developing their brand and selling that to community members. Social media now offers the chance for all schools to develop their brand. Use these tools to share the great things teachers and students are doing on a daily basis. Leverage the awesome things that are going on in your school and your district. I've hear Eric say something like "Create the news you want for your district or others will write the story they want." He is right. There are things I have wanted to brag about, but the news was not going to come to me, so I went to them. I engaged local newspapers in social media to get their attention and feature the cool things my students accomplish. The more positive news that goes out to the public, the more people it can attract and retain that will be invested in the school and the district. I love this chapter because it supports something that many of us have been advocating for many years; Social Media is a positive force in Professional Development and Personal Growth. Eric shares the stories of +Lyn Hilt and +George Couros and how becoming connected educators impacted their growth as educators. The top down approach to PD is no longer the only way for teachers to learn and grow as professionals. There are so many great resources for educators today and social media is just one of the many tools that schools and districts need to look at when thinking about providing the best PD out there. The new view of PD in the social media world is the Personal Learning Network (PLN). What makes this different from the old form of PD is that PLNs are all about two-way communication. People in a PLN are there to learn AND share. This is a great environment that encourages growth and learning because the educator can look at all of the information and engage experts in real time. Eric says that being connected needs to become the standard for educators and I completely agree with him. I find it so hard to explain to my friends why I have invested the time I have on Twitter, my blog, podcasts, etc. I feel like PLNs are one of those things that need to be experienced first hand to truly understand them. I didn't know I was building a PLN when I joined Twitter. I just wanted to learn from others and share what I thought. I see know that it has helped shape me into a better teacher in a way that district provided PD never could. I asked Eric if this book was for teachers or just for admin and he said all educators could take something away from his book. This book is for those educators out there that are not connected and fear change in the technology driven world. This book is what needs to be given to Superintendents and Principals and School Boards that fear social media and what they think it could do to their school districts. Eric writes a wonderful book giving readers every reason in the world to embrace the positive changes that technology can bring to schools. I recommend this book to anyone in education that needs convincing that technology is here to stay and important to education. You can buy Eric's book on Amazon here! There is a great feature that many people do not know about in Evernote. The Reminder feature has been around since last May and it has had a huge impact on the way my students stay organized in my classroom. For my classes, I've created public notebooks that students can join, but they do not have any editing rights. One of these notebooks is for the daily assignments. These could be the assigned reading for the day, information on longer projects or anything I want the kids to know on any given day. The students can access these notes in the notebook on their personal device through Evernote. I do not use my school website to store my class assignments because all of my students have their accounts. I even have some parents that have joined the notebook so they can see assignments on their Evernote account without having to navigate the district website. In a note, a user can create a reminder. When the user has their notifications turned on for Evernote, they will see a reminder pop up on their screen. This could be used for meetings, shopping lists or anything you want to remember and might need notes or other information. The cool thing about the reminder feature is that it works for anyone that has joined the notebook. My students that have joined the notebook will get any reminder I have set for a note. Every day I create a note and I set the reminder for 3:05PM. This is the final bell for the school day. One of the things that kids do when school is out is take out their phone. For my students, the first thing they will see if they have their reminders turned on is a reminder for the day's work. If the student logs into Evernote later in the day, they will see a list of reminders they need to check off to get rid of them. I'm always looking for different ways to reach my students and let them know they have things to do in class. Since I am always creating these notes anyway, it's very simple for me to through the reminder on the note and have that for my students who need it. Evernote continues to innovate new ways to make it easier to "Remember Everything" and the reminder feature is just another cool tool to help everyone do just that. In the coming weeks, I will be writing a bit more on Evernote. I am trying out the Post-It Notes that work with Evernote and the Jot Pen that helps with annotation on Skitch and Evernote. If you ever have any questions about Evernote, please drop me a line. It's my duty as the Evernote Ambassador to help Evernote peeps when they are in need. I always make sure to tell all educators that technology is about baby steps. As "techy" teacher, it appears that I have used every tool to the full extent from the very first day I started using the Internet. What teachers do not see are the many many tools I have used incorrectly or the tools that just didn't fit my instructional style. There is a vast wasteland littered with remains of programs that I was excited about, tried, and then realized were not for me or my students. I learned to focus on what was working and use it well. After some time with a tool and feeling like I have mastered it, I would explore a new tool. I took baby steps with all of the tools I have ever used. At the end of the year, I evaluate the tools and decide if it will stick around. Either way, I look to add a new one for the start of the next school year. As a connected educator, I see tons of great new tools shared on a regular basis and I have to fight the urge to try and use them immediately. If I want to do it right, I need to take my time, learn how to use a tool and think out who it fits into my classroom. Friar Laurence said it best in Romeo and Juliet "Wisely and slow; they stumble that run fast"
I encourage teachers out there to find one new tool to explore, have fun trying it out in class and then reflect on its use at the end of the year. When you are done, look for another one for the next school year. Over time, teachers will no longer be paralyzed by technology and will become the "techy" teacher in their building. This past week my students held a Mock Trial for Mark Twain. We had just finished Adventures of Huckleberry Finn and Twain was being charged with Racism. Some students were prosecutors, other worked on the defense team, some were witnesses (characters from the story), and the rest were on the jury. I have been doing this project since I started teaching 12 years ago. It's a fun and different way to look at Twain's writing and discuss his intentions. The kids think it is a blast and it always gets them fired up. I'm occasionally asked how I know my kids are learning. "How do you know they are actually learning what you want them to in class?" This is a great question, but such an easy one for me to address. When I used to stand in the front of class and talk to the students for 48 minutes, I had no idea if they were learning anything. When I gave them a test and a bunch of bubbles to fill out, I had no idea if they know the information or they were really could at multiple guesses. Now that I focus more on guiding my students and allowing them the freedom to explore the ideas in groups, I can see what they are learning. Not by talking to them, but by listening to them. I look at the projects my students work on in class and I'm always blown away by their understanding of a topic we have discussed in class. By taking a step back in the classroom, I have allowed the students to take a big step forward. It's loud, messy, and I know it when I see it. What does learning look like to you?